“Focus on one of the sketches you did earlier in the week, and make a symbol out of it in vector graphics for a fictional product or a company. The goal of this task was to train our skills to express a visual message through a symbol. The color choice is supposed to enhance the message. I’ll start with the vision behind the idea I came up with. So, I obviously sketched a few bell peppers earlier in the week, so I had to base the idea around this. 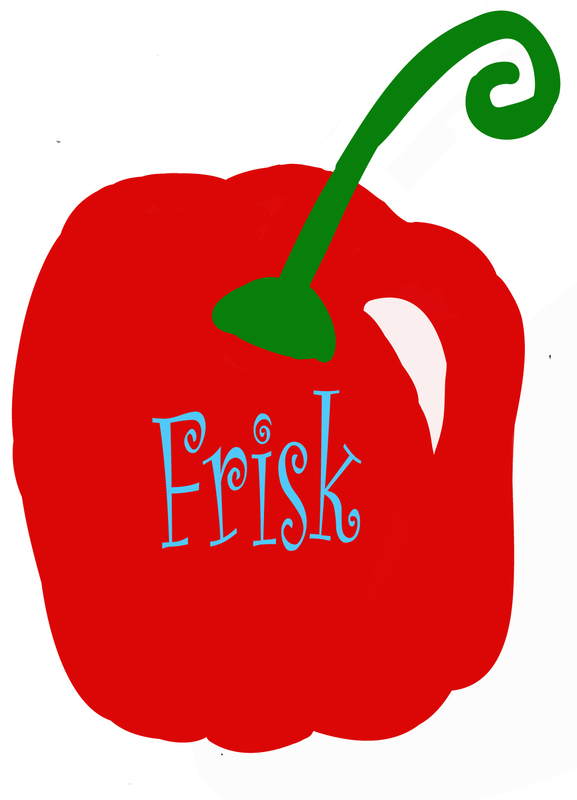 The idea is a company called “FRISK” (fresh in English). This company only retails organic vegetables to different food markets and convenience stores in Norway. Bell peppers naturally have bright and fresh colors, so I decided to stick with the natural colors in the symbol it self. The reason I gave the stem a bit of a twirl, was to lighten up the whole look, making it a bit more interesting to look at. It also suits the font I chose. I’ve chosen one primary color – red. One secondary color – green. And also a tertiary color – blue/green, for the font itself. Tertiary colors: Blue/Green,Red/Orange, Red/Purple, Blue/Purple, Blue/Green and Yellow/Green. Red – Associated with power and energy: Sales point would be that organic vegetables is healthy and will give you energy and power. Blue(/Green) – Peace and harmony: Sales point would be a sense of peace and harmony when eating organic vegetables. Hei, Kanskje du har lyst å prøve deg på å lage en head’er til bloggen min?!? Jeg har ikke photoshop eller tålmodighet! Hahaha! Hehe – det kan jeg sikkert. Bare send meg den du vil ha, så kan jeg justere grafikken. Bare forklar hvordan den skal se ut. Skal du ha bildene mine til kalenderen i samme sleng?